Showing results for "hanging pot rack"
Product Description: Enclume Premier Gourmet Hanging Pot Rack. Clean out that cluttered utensil drawer, organise your cookware and put that colander, bowl, or garlic roaster atop the grid (even hang your garlic)! Gourmet chefs have their gear in one location and now Enclume's ne pot rack with utensil bar combination brings that convenience to your kitchen. 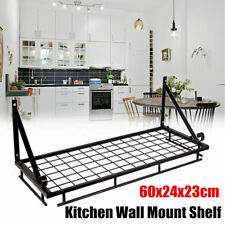 Comes with 24 straight pot hooks (12 large and 12 medium) and mounting hardware. Superior Hot rolled steel construction of this original design along with Enclume's signature hammered steel finish with a protective acrylic coating add lasting value. 5 Year Limited Warranty. Hand wrought by skilled craftsmen and proudly made in the USA. Some assembly required. Dimensions: 80cm L x 46cm W x 70cm H; Weight: 14kg. 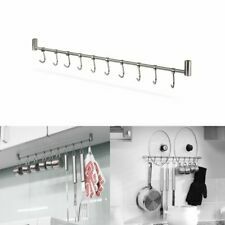 eBay Wrought Iron pot rack hanging style for kitchen.